A.D.B., or adaptive driving beam headlights, use sensors and cameras to continuously shape a vehicle’s high beam so that it illuminates only areas without oncoming traffic, while throwing light elsewhere far down the road. The goal is to shape the light, throwing it a maximum distance while keeping it out of the eyes of oncoming drivers, whether they’re in a tractor-trailer or on a motorcycle. Doing so requires sophisticated software, sensors and cameras capable of quickly and accurately detecting oncoming traffic. If you want to see farther at night while driving, there’s a simple solution: Never cut your high beams. Of course, that’s a terrible idea. While your lights might brightly illuminate the road ahead, you’ll also be blinding every oncoming driver. Unfortunately, standard American-spec low beams — no matter how bright — typically do not throw light far enough to allow drivers to stop in a hurry. But there’s another solution. A.D.B., or adaptive driving beam headlights, use sensors and cameras to continuously shape a vehicle’s high beam so that it illuminates only areas without oncoming traffic, while throwing light elsewhere far down the road. Audi, BMW, Mercedes and Toyota, among others, already offer this type of lighting. But not in the United States, where A.D.B. lamps are illegal. However, change is on the horizon, although maybe not quite within range of even the high beams. The government is considering a rule to allow these smarter headlights, but it may take as long as two years for it to be approved. As it stands, the National Highway Traffic Safety Administration mandates that vehicles have distinct high and low beams, disallowing lights that can dynamically adjust. Drivers can use their high beams when conditions permit, but few do. According to a study by the Insurance Institute for Highway Safety, only 18 percent of drivers at best used them on a rural road with no oncoming traffic. To improve their use, some manufacturers offer automatic high beam switching, technology that uses a vehicle’s built-in camera to turn on the brights when there’s no nearby oncoming traffic. But that still limits the light available when there is. Automobile companies and car aficionados have been critical of the government’s position on adaptive beam headlights for years, urging the National Highway Traffic Safety Administration to move away from what they see as an archaic approach to vehicle lighting. Last month, supporters of this technology got good news when the agency issued a notice of proposed rule-making that, if approved, would finally allow these headlamps in the United States. Adaptive headlamps will be a huge improvement over today’s lighting, said Mike Hernandez, the technical manager for safety standards at BMW of North America. More illumination gives drivers more time to react to dangers on the road, and studies by Rensselaer Polytechnic Institute’s Lighting Research Center predicted better safety when adaptive beam headlamps are used. Two systems are used to produce A.D.B. headlamps. 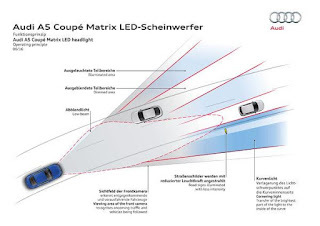 Matrix headlights, such as those from Audi, use multiple LEDs that can be turned on and off in different groups to alter the beam pattern. Other systems use a combination of projector lamps and shades that can cover parts of the beam. In development are pixel systems that can trim the light point by point, and a laser system that uses micro-mirrors. Whichever technology is used, the goal is to shape the light, throwing it a maximum distance while keeping it out of the eyes of oncoming drivers, whether they’re in a tractor-trailer or on a motorcycle. Doing so requires sophisticated software, sensors and cameras capable of quickly and accurately detecting oncoming traffic. Much of that gear is already in modern vehicles. The initial specifications proposed by the National Highway Traffic Safety Administration differ from those that have been in use for years in Europe and elsewhere. In other markets, A.D.B. high-beam lights can put out twice the light intensity currently allowed for high beams in the United States. And the agency wants A.D.B. headlights to also put out a minimum amount of light everywhere, even in the shadow areas where an oncoming driver’s eyes might be. Neither idea is a good one, Mr. Stern said. He pointed out that as long as the light didn’t dazzle an oncoming driver, brightness could be safely increased to European standards. And projecting a minimum amount of light in every area could still blind a driver at certain angles. “It does not make sense to have a high-beam limit with A.D.B. lamps, as there won’t be any glare,” said Matthew Brumbelow, senior research engineer at the Insurance Institute for Highway Safety. He said his organization would ask the federal highway agency to allow A.D.B. high beams to be brighter. In anticipation that these headlamps will be approved, Audi already sells vehicles in the United States with “matrix-design” LED lamps that need only a software upgrade to turn on the adaptive beam, Mr. Berlitz said. If the American standards differ from Europe’s, new software will have to be written, he said. While Canada typically follows United States vehicle safety standards, it decided this year to allow A.D.B. headlamps that conform to the European system. Those interested in commenting on the proposed rule-making can do so until Dec. 11. Most of the comments so far are of the “What took you so long?” variety. Allowing time to incorporate industry comments and standards modifications, many of the interested parties expect that A.D.B. headlamps won’t be legal for 18 to 24 months. Once they are, they should be quickly available. “Within weeks after they’re allowed, they’ll be in the market,” Mr. Larsen of G.M. said.